At last — you’ve decided to say goodbye to your traditional phone service. Maybe you’ve heard from other business owners about the benefits of switching to VoIP or maybe you’ve been doing your own research. While there are clear benefits to VoIP phone service for your business, navigating the options and features of VoIP providers can be complicated. Communications utilities that require contracts, commitments or service tiers do not understand that small businesses need flexibility. VoIP systems like Ooma Office give you complete flexibility. At any time you can change your service to add more users or subtract users. With Ooma, your phone service grows with your business, and you’ll only ever pay for what you need. Never pay for a 10-20 user contract when you only need service for 11 users. It’s important to verify that your VoIP phone solution doesn’t get lost in the bells and whistles of excessive and complex features without providing you all the basics that you need for your business. Ooma takes this core functionality seriously. Our business VoIP service includes unlimited minutes within the U.S. and Canada, international rates that are pennies per minute, advanced 911 service, Virtual Fax, and more. Plus Ooma lets you keep your existing business phone number with a free number transfer. High call quality is of critical importance to your business. Your phone service should allow you to speak and listen without the technology getting in the way of your communication. Not only does Ooma Office offer HD audio, but its PureVoice™ technology uses advanced voice compression and adaptive redundancy to provide excellent call quality even under variable Internet environments. Furthermore, PCMag’s Business Choice Awards have named Ooma the #1 VoIP service for the past five years. The PCMag survey ranked the phone services on a range of factors, including reliability, tech support needs, tech support quality, and likelihood of customers recommending the service. 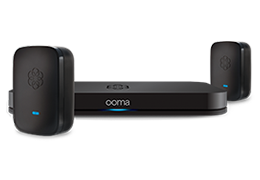 “Ooma continues to dominate reliability scores for the fourth year in a row with a 9.2 (showing a steady increase of last year’s 9.1 and the previous year’s 8.8),” said the editors. And when calculating the net consumer satisfaction by subtracting dissatisfied customers from those likely to recommend the product, Ooma ranked 89%, “one of the highest Net Promoter Scores I’ve seen,” said one editor. For VoIP to be a true business solution, it should provide comprehensive phone service at your office while also allowing users remote access via their cell phones. The Ooma Office mobile app gives you full access to your phone system no matter where you are. You can make or receive calls on your work line as though you were in the office, check your voicemail, transfer callers, and more. We’ve heard from many customers how using the Ooma Office app has prevented them from having to give out their personal cell numbers to business clients. With the app, you have the location flexibility of a cell phone, while still keeping your work calls separate from your personal calls. 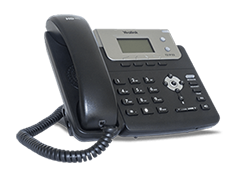 The advanced set of phone features included with VoIP phone service can streamline your business calls. Ooma Office provides a rich set of inclusive amenities. You don’t have to pay extra for tools like a Virtual Receptionist, conference bridge, voicemail audio to email, dial-by-name, or music on hold. Not only do these amenities streamline your business operations and improve your communication efficiency, but each user has access to what they need at no extra cost. Speaking of cost, your phone service should support your business and not drain its resources. Indeed, price may be one of biggest reasons why you are choosing VoIP over traditional business phone providers. Ooma Office is just $19.95 per month per user for comprehensive and advanced service. Not every company has a dedicated IT department. That’s why your VoIP phone service should be easy to set up and easy to manage. It’s easy to set up your account through our online portal, Office Manager, and most customers are up within 10-15 minutes. And if you need to update your service or settings, you can access this portal anywhere you have Internet. PCMag editors said, “Ooma Office is possibly the simplest small-business voice system to set up.” Our installation is user-friendly, we offer wireless phone extensions for complicated building layouts, and our web admin panel makes it easy to change your service or adjust your settings. “Ooma’s management interface is one of the most modern and attractive of those I’ve seen,” said PCMag. Learns more about Ooma Office VoIP phone service for businesses to see why it has been selected as the #1 service in PCMag VoIP Business Choice Awards for the past five years.